Splinters produce a wide range of handcrafted goods in the workshop onsite, often from recycled wood. 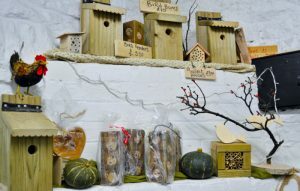 Bug hotels, bird boxes and feeders are just a few of the products available, so as the winter months continue, why not give our friendly bugs and birds something to make them comfortable, after all, who doesn’t love a meal out and a stay in a hotel? We also have kindling and logs available to keep you warm and cosy too. For more information, please get in touch on 0117 958 6206.